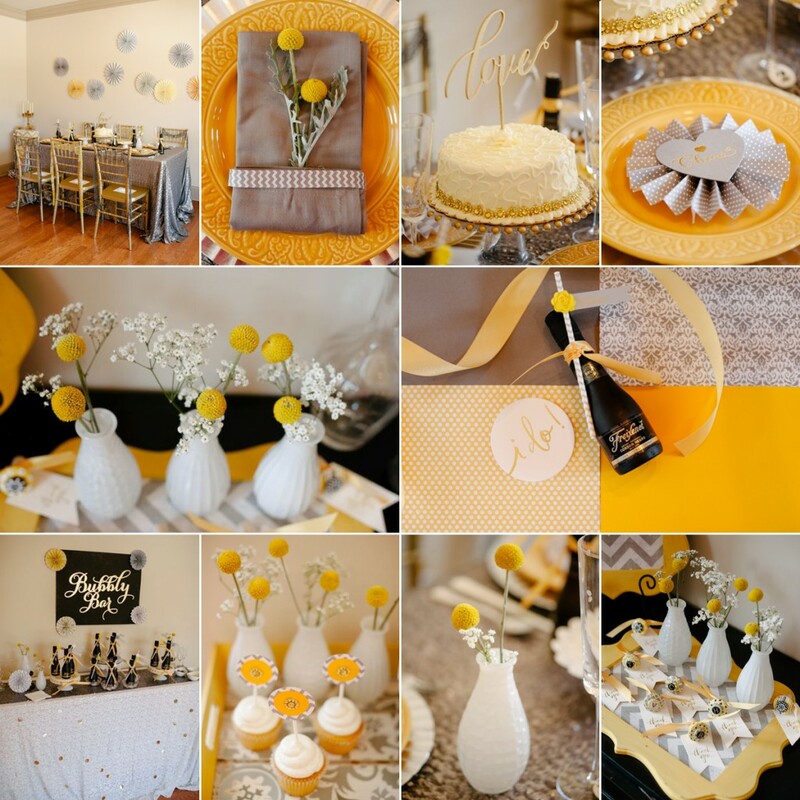 Home Color Ideas	“Bubbly” Yellow and Gray Engagement Party Styled Shoot! I am so excited about this “Glitzy and Glam Art Deco Inspired Engagement Party” feature on The Perfect Palette! Chrissy used shades of yellow and gray, along with lots of sparkle, to make this engagement party idea one to remember. Be sure to check out all the details, like mini bottles of bubbly, handmade pinwheels, handcrafted chocolates, beautiful chiavari chairs with Art Deco inspired embellishments, sparkly table linens, chevron accents, and the easiest DIY floral arrangement idea you’ll ever see! Oh yea, and we, FiftyFlowers, provided the fun florals which included Bubbly Billy Balls, Fluffy Baby’s Breath and Silvery Dusty Miller! Take a look at this sneak peek, then head over to The Perfect Palette to see all the great details! Special Thanks to Lauren Rae Photography for capturing all the great details! I absolutely adore the simple arrangements of Baby’s Breath and Billy Balls! It is the perfect mix of Vintage, the Small Milk Glass Vases and the Baby’s Breath, and Modern, the Billy Balls! And talk about so easy to make! A few springs of Baby’s Breath and a couple Billy Balls is all you need for each vase, making it not only a super easy DIY project, but also very cost effective! Love! Want More? Head over to the Perfect Palette to see the full post!